The leading web hosting review site Top-Cheap-Web-Hosting.com announces that it's suffered from content delivery network (CDN) on Google organic search traffic in the week ending March 17, 2012. 2 weeks after moved the whole site to Internap CDN resold from Softlayer on Feb 24, the Google organic search traffic was dropped by 44.8%. The desperate advertising of content delivery network misleads many webmasters move to it for faster loading speed and better SEO without full evaluation, but suffered from the drop of Google traffic seriously. Top-Cheap-Web-Hosting.com is one of the victims. In 2 weeks experience of CDN, the Google organic search traffic was dropped by 45% as well as Google crawled pages daily and page downloading speed shown in Google Webmaster Tool. As a result, TCWH lost over 30% of revenue daily. TCWH used Origin Pull mode of CDN, created a mirror website complete same as the main website with the sub domain CDN-http://www. Then removed the main domain WWW from A HOST record and add it as a CNAME record mapping to the Internap domain. In the expectation and initial analysis, in this case, the requests to the main domain WWW will be routed to the Internap CDN entry, and eventually be routed to pull the content from CDN-http://www. This absolutely followed the instruction of using CDN Origin Pull mode in Softlayer as well as the information found over the Internet. The website works correctly and delivers content faster to global users by leveraging CDN than ever before. TCWH analyzed the drop of Google organic search traffic might be caused by the following 3 reasons. 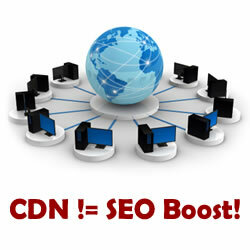 Read the details of analysis and the suggestions on Content Delivery Network (CDN) to SEO here. Top-Cheap-Web-Hosting.com (TCWH) is a leading web hosting review website. TCWH, reviews web hosts independently based on the true experience and feedback from real customers. The mission of TCWH is to help people find the best web hosting deals, and save time and money from a bad choice.